Yesterday, I posted this fun little freebie about chores. The goal of the activity was to practice using verbs and nouns, but someone on my Facebook page worried that the activity might be too hard for her students because many of them do not have to do chores. This led to an interesting discussion about how few chores many kids are doing these days. One teacher suggested that the activity could be used as a teachable moment, so taking off on that idea, here are some ways to extend the freebie and possibly get kids to take on a little more responsibility. Ask students to put a star next to every chore they have done and to put two stars after chores that they do regularly. Create a class bar graph of the results (how many students do each job). Ask students to number the chores from easiest to hardest. Brainstorm a list of chores that are just right for the students in your grade. Brainstorm a list of reasons why it is good for kids to help around the house. Ask each student to choose one new chore that he or she will complete this week. This could be a homework assignment that students would complete by writing a paragraph about how doing the new chore went. You might also want to require a parent signature. 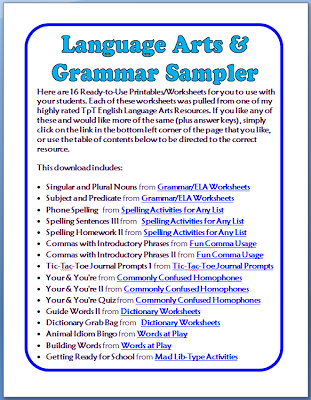 Have younger students write “I can…” statements. For example: I can make my bed. I can set the table. You could have them write them on stars or another fun shape and post them on a bulletin board. Do you have an idea to add? Please comment. 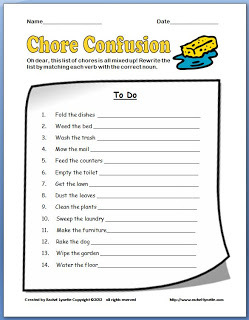 And don’t forget to download your Free Chore Confusion Printable!